This article submitted by Linda Stelling on 6/30/98. The Paynesville Area Senior Center is one of four places in Minnesota that recycles eyeglasses. The Lions Club organization collects the eyeglasses as a recycling project and as a service to the needy in poor areas throughout the world. Since the senior center started recycling glasses in June 1992, it has handled over 100,000 eyeglasses (single vision glasses and bifocals), which includes about 25,000 that had to be discarded because of lens scratches or damage, broken frames or just not suitable to be recycled. 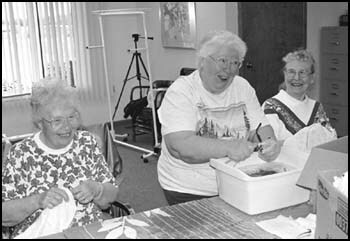 Each Tuesday morning, from 9 to 11 a.m., eight to 12 volunteers gather at the Paynesville Area Senior Center to clean, sort, read the prescription, package, label and pack for further shipment. Mary Winther said she enjoys the companionship the group of volunteers share while recycling eyeglasses. She added that besides recycling glasses from the Paynesville area she also picks up glasses from her St. Cloud optometrist. Steve Whitcomb, Paynesville, collects eyeglasses through the Lions Club for the VOSH program which the Paynesville Area Senior Center recycles. Once recycled, the eyeglasses are sent to Dr. Jim Hess, Crystal. There they are again sorted according to prescription, packed in special cases of about 250 eyeglasses per case and then sent or taken with a VOSH team (Volunteer Optometric Services to Humanity) to a needy country. During 1996 VOSH groups headed to Guatemala, India, Venezuela, Mexico, Nicaragua, Jamaica, Honduras, Uganda, Philippines, Dominica, Cuba, Ecuador, Bolivia and Tobago-Trinidad. In 1997, groups visited Russia, Brazil, Bagledesh, Tanzania, and wherever requested. Paynesville volunteers taking part in the VOSH trips have been Elaine Vanderpool, Marian Putzke, Don Torbenson, LeRoy Hillbrand, and Jim McCalmant. In May of 1998, the millionth pair of eyeglasses was brought to the Lions statewide convention in Bloomington. To put this in perspective, a million eyeglasses laid end-to-end would span 29 miles. Eyeglasses collected by the Minnesota Lions go to the Sight First Recycling Center in Rosholt, Wis. There volunteers clean, measure, and pack the glasses for shipment to developing countries. Because the program is volunteer-driven, it costs only eight cents to fit an individual with a pair of glasses. Arne Anderson, Edina Lions Club, is one of the leading collectors of used eyeglasses. He spends several hours every month visiting businesses participating in the program to empty their collection boxes. He alone collects over 6,000 eyeglasses in a year’s time.